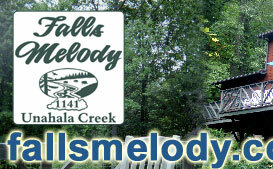 Falls Melody- Escape to the Beauty of the North Carolina Mountains! Hiking, Rock Climbing, Biking, Golf, Amusement Parks, Fishing, Hunting, Wildlife Viewing, Horseback Riding, Shopping, Restaurants, Live Theater, Cinemas, Museums, Sightseeing, Swimming, Boating, Sailing, Water Skiing, Jet Skiing, Rafting, Downhill Skiing, Snowmobiling. *Near the house is "Sliding Rock"- take Unahala Creek back to Alarka Road, turn left. About a mile, pass the metal gate on the left hand side of the road, about 100 feet further on a pull out is on the left with a large rock marking it. You can slide down the rock into the natural pool below. Every Saturday from June 10 to October 28. 6:30pm. Free. Bluegrass and old time mountain music concerts. Downtown Bryson City, Everett Street Train Station 800-867-9246. Lake Fontana: muskie, walleye, bream and bass. NC fishing license required. 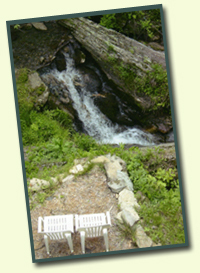 Great Smokey Mountain National Park: valid NC fishing license required, but no trout stamp required in the park. 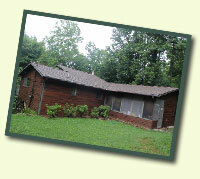 Cherokee Reservation $7 per day, no NC fishing permit required. 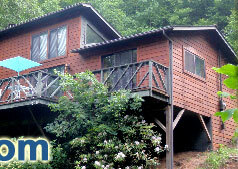 All local creeks not in the national park, NC fishing license and trout stamp required. 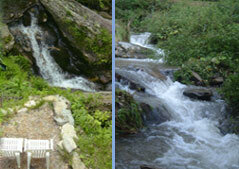 There are trout in the Alarka Creek, and in the Unahala Creek, just not up as far as the cabin. Cherokee: downtown, best shopping for the kids, Lots of Indian related souvenirs. Dollywood: Hwy 441 North, follow signs to Gatlinburg, TN.